‘숲의 파도 셸터’는 연미산 숲 속 나무들의 잎이 떨어진 계절에 모은 나뭇가지들로 만들어졌다. 그 셸터는 땅에서 올라오는 ‘파도’의 모습을 띄고 있다. 파도(물결, 음파, 그리고 빛의 파동)은 강력한 힘이다. 결코 멈추지 않고, 항상 진화하며, 또한 덧없이 사라진다 – 자연 속에서의 예술과 마찬가지로, 그리고 이 작품 자체와 마찬가지로. 잠시 쉬면서, 명상을 하고, 조용히 당신의 주위의 세상이 끊임없이 변하는 것을 느껴보라. 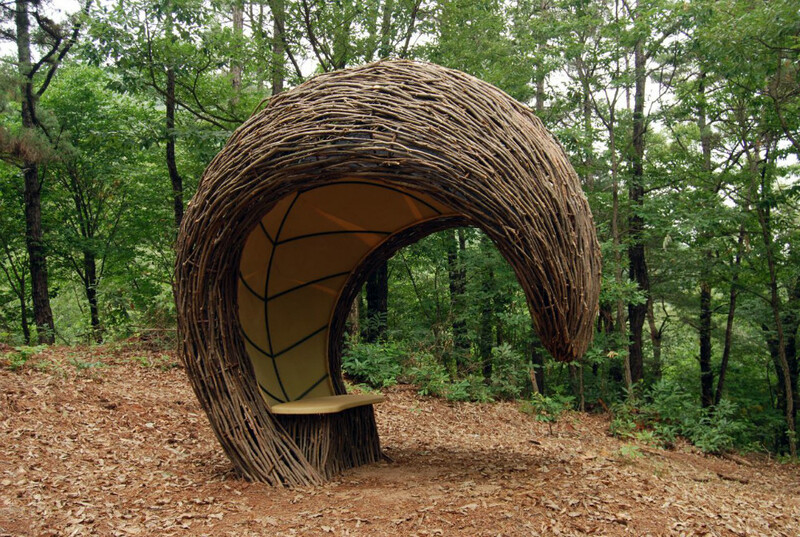 The ‘Forest Wave Shelter’ is made from branches collected during the thinning of the forest at Mt, Yeonmi. The shelter takes the form of a ‘Wave’ rising from the ground. Waves (water, sound and light waves) are a powerful force, never static, constantly evolving, and ephemeral – like art in nature – like this work itself. Please rest a while, contemplate, and take the time to notice of the ever-changing world around you.